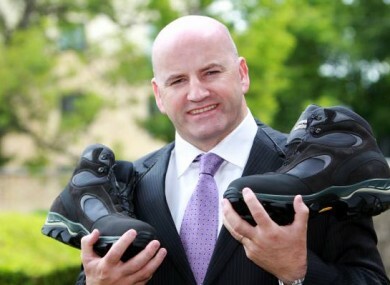 Has Dragons Den investor Sean Gallagher gotten off the mark in his quest to contest the Presidential Election? DRAGONS’ DEN INVESTOR Seán Gallagher appears to have taken the first step towards securing a nomination to contest Ireland’s presidential election in October. Gallagher this evening said he had won the support of Longford County Council, which voted to nominate him as a candidate in the election to succeed Mary McAleese later this year. The resolution, which would take effect once the election is formally called, would give the Cavan native the first of the four nominations he will need in order to successfully get his name on the ballot papers. Gallagher had been mooted as a potential Fianna Fail candidate in the last general election but is contesting this election as an independent. RTÉ News reported that there was some confusion over whether the council had, in fact, approved Gallagher’s nomination – Fianna Fáil members, and the independent chairman, said the motion had been passed by 10 votes to 9. Fine Gael members insisted, however, that the only vote that took place was on an FG amendment which was defeated by the same margin. They insist that after their amendment was defeated, the original motion was not actually voted on. Only one other independent candidate – veteran senator David Norris – has so far secured a nomination, winning the support of Fingal County Council. Another independent candidate, Niall O’Dowd, today confirmed reports he would be seeking meetings with both Sinn Féin and Fianna Fáil later this week in attempts to secure a nomination from 20 members of the Oireachtas. Fianna Fáil have 33 members in the Oireachtas, and Sinn Féin 17 – and while neither appears set to run a candidate of their own, O’Dowd could conceivably win the support of a loose affiliation from either party, supplemented by the support of independent members. Candidates are required to win nomination from either 20 members of the Oireachtas, or four county or city councils, in order to contest the election. Yesterday Labour formally chose party president and former minister Michael D Higgins as its candidate. Email “Off the mark: Longford council backs Seán Gallagher’s presidential bid (...or does it?)”. Feedback on “Off the mark: Longford council backs Seán Gallagher’s presidential bid (...or does it? )”.